We’ve upgraded the CMS this week as part of our work towards a more responsive website. 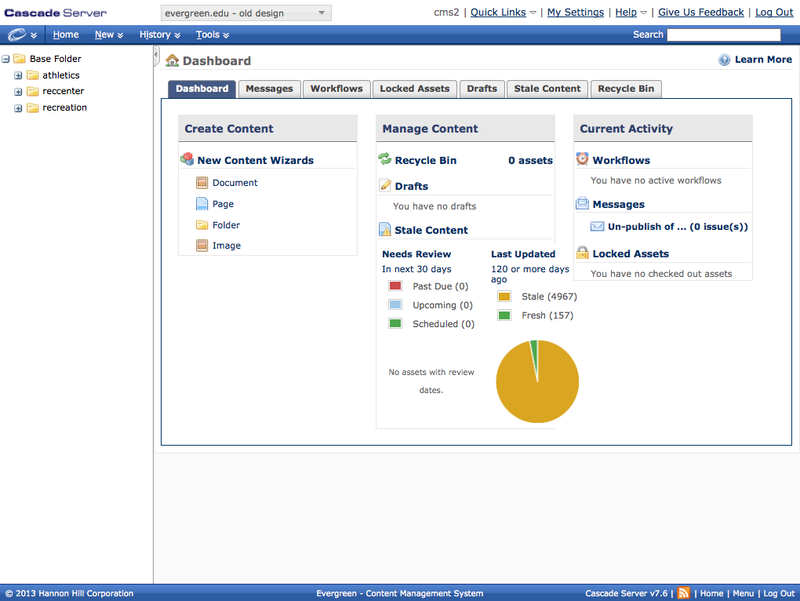 CMS users will notice a few changes, which we’ve tried to outline here. As always, if you run into any issues or have problems, let us know. You no longer have a “Starting Page” when you log in. 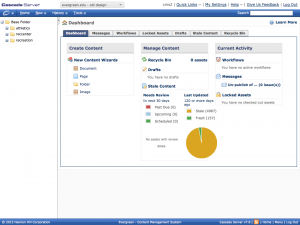 Instead, you have a dashboard with tools for managing and creating content. The site header, which was looking strange for a bit, now looks much as it does on the main site. Cascade now auto-saves drafts while you work. To be honest, we’re not entirely sure how this works, since we haven’t worked with it yet. Just submit & publish as usual, and let us know if something weird happens. Now that this upgrade is done, we can start moving on converting sections of the website to the new responsive templates. Keep an eye out for more info on that! This entry was posted in User Group and tagged webresources on October 23, 2013 by Elaine Nelson. We’ve been hard at work doing a lot of research and under-the-hood work to make some major changes to the web site. We hope you’ll find the new layout and wayfinding more useful and intuitive over the long term, but we understand that you might be confused about where some links have gone. The new global header for evergreen.edu features five main links: Home, Academics, Campus Life, Costs & Aid, and Admissions. Much of our global navigation is the same. (That’s the list of links at the top of every Evergreen page.) There are a couple new items worth noting, though. The header is now primarily geared toward explaining all about Evergreen. Home is where you’ll discover what makes Evergreen a unique college to attend. The Academics section talks about just how it is we go beyond classes, majors, and grades. Campus Life is all about non-academic life at Evergreen, including living and playing. 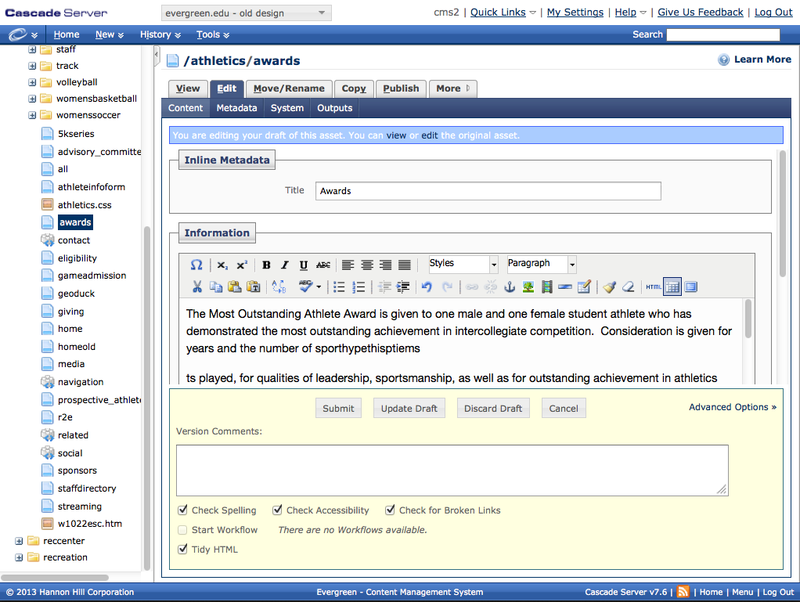 The former Athletics tab has been moved under this page. Costs & Aid breaks down tuition costs and how you can get scholarships and other aid to help cover those costs. Finally, the Admissions tab covers everything a prospective student needs to know about applying to Evergreen. We’ve also moved a few of the previous navigation tabs around. Athletics has been moved to its new home in Campus Life. Directories is still in the header, under the search field. In case you were looking for a job here, Employment has been moved to the footer. The new search area now features links to my.evergreen.edu and Webmail. We used some tools to find out what current students and faculty & staff were clicking on in their respective pages, and by far you were all going to my.evergreen.edu and Webmail. We’ve made it super easy for you, because now you can find those links at the top of every page, right underneath the search bar. Another item in that area is a link to Directories, where you can find the lists of faculty and staff that you need to get in contact with. 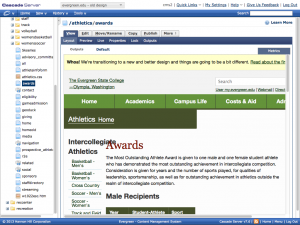 On smaller screens, press the profile icon for links to my.evergreen.edu and Webmail. On smaller screens, press the magnifying glass to reveal search tools. Our goal is to have all pages mobile-ready by July 2014, but several pages have already been optimized for your phones and tablets. We’ve tried to keep as much of our content exposed as possible, because our hope is that you’ll get a consistent and predictable experience, no matter your device. In the case of the header, on small devices, we’ve moved a few of the items behind some toggles. 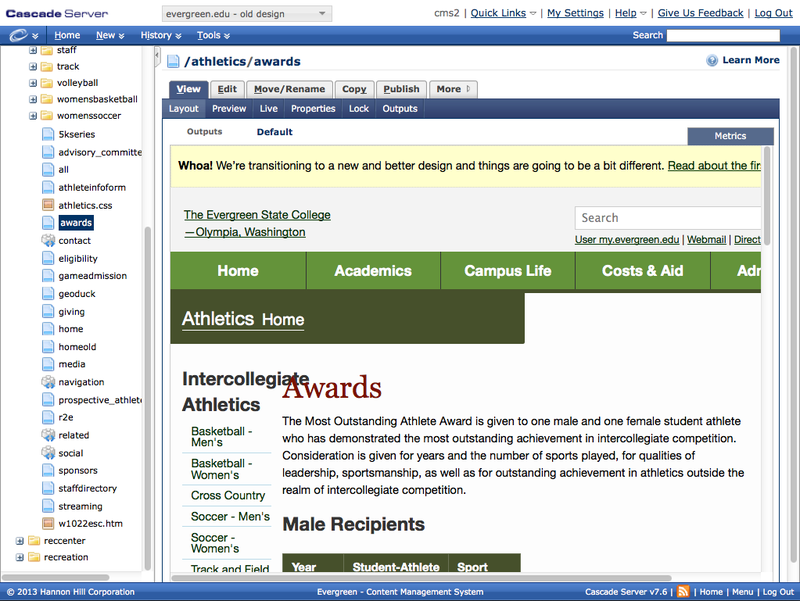 Pressing the magnifying glass icon will open up the search and directories, while the user icon will reveal my.evergreen.edu and Webmail. The rest of the global navigation will continue to appear more or less as it does on your desktop computer. This is just the start for some big changes to come. We’re chugging along, and making continuous updates to keep Evergreen’s website up-to-date with the latest innovations. We hope you’re finding what you need, but if you notice any bugs, please send them to us and we’ll try to get it fixed as soon as we can. 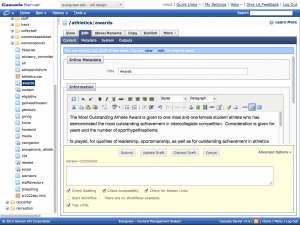 This entry was posted in Uncategorized and tagged webresources on October 4, 2013 by Justin McDowell.